Lawyers respect the term partner. That's why we want to be yours. The experienced attorneys at Weissman represent businesses and individuals throughout Georgia and the Southeast. Clients trust our litigation and trial attorneys to provide proactive, results-driven representation based on solid case management, proven trial skills, and our personal approach. 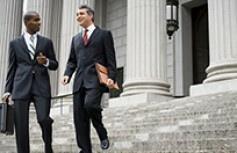 Our litigators advise clients using innovative legal strategy to solve problems ranging from general business disputes to complex real estate matters, from personal injury cases to construction defect claims. As client advocates, we understand that lawsuits can be costly business variables, and we resolve disagreements in the manner that supports your best interest using cost effective methods. We are committed to listening to our clients, understanding your needs, evaluating risks, and providing proactive strategies to match your goals. The firm represents clients in all types of disputes including trials and appeals in state and Federal courts, administrative hearings, and alternative dispute resolution, whether negotiation, mediation, or arbitration. Several of our litigation attorneys are certified mediators and arbitrators and serve as neutrals for dispute resolution. We are also called upon by local courts and judges to serve as mediators and special masters by Judicial appointment.